Dry fasting is also known as an Absolute Fast, Black Fast, and Hebrew Fast. This is fasting at its extreme, and usually only attempted for spiritual clarity and/or union. Quite simply, dry fasting is the practice of denying oneself both food and water. It is included here more for informational purposes than anything else. It is not recommended. Unlike other types/styles of fasting, dry fasting has not been studied to the same extent, so is lacking in supportive evidence of its efficacy to physical health. It's usually only done for one day or less; dry fasts longer than one day usually happen only by accident and not by design, i.e. extreme illness or duress. Among those who perform a dry fast, some of the symptoms/effects reported include extreme weakness and lethargy, sensitivity to light and sound, dizziness, and feelings of depletion. In the distant past, when dry fasting was practiced more commonly, and usually performed as a sacrifice or a show of faith, it was done by a healthy individual -- healthy to a degree difficult for us to attain who live in technology-laden societies. Modern day toxins find their way into our systems, no matter how carefully we try to prevent it. A dry fast may cause too quick a release of toxins that then have less fluid than usual with which to be carried away. The release of hard metals into the system would be the most damaging. Detoxing into a dehydrated system isn't wise. And, even if you're fasting not to detox, but for spiritual reasons, there is no way to avoid the natural detoxing that will occur. Having said all that, if you really want to do a dry fast, if you feel guided and compelled, work your way up to it. Start with easier and gentler cleansing fasts, like juice or fruit, and follow a cleansing diet for a few months. Following a raw food diet is especially helpful. an extreme fast as dry fasting. You might also try following the Orthodox Church's absolute fast, which begins Saturday night and ends Sunday morning after communion. Fasting is never to be an abuse on your body. Follow your inner guidance, and maintain your intention to honor and respect your physical body, as dry fasting isn't about increasing physical health, per se; and one of your spiritual responsibilities is to maintain the health of your physical body--your soul's temple. For more information and very interesting reading, try googling ChiGong or QiGong. This practice is thousands of years old and purports to consciously direct and/or influence Chi, or life force, energy. In its history are examples of Masters living from the pure energy of Chi, and not from the energy of food or water. Traditional Chinese medicine and acupuncture and acupressure share many of the same core concepts with ChiGong, although ChiGong actually predates them. 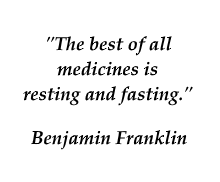 Partial Fasting offers easier and gentler methods of fasting.